This puzzle has been vexing me for some time. Why is one correct and the other not? Uberdude: because in the wrong one white is not totally dead, it is a ko. So white can play a move somewhere else on the board that threatens something, and if black answers it then white can retake the ko which puts black into atari. 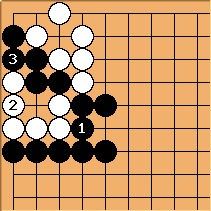 If black doesn't answer the threat but takes the stones white will follow up the threat and gain elsewhere. With the correct answer white is totally dead, and can't even gain something from a threat that goes unanswered elsewhere.